Michigan's oldest inland city, Pontiac has a rich if hardly recognized history. The seat of Oakland County will soon celebrate the bicentennial of its settlement in 1818. Since then, the city's trajectory has mirrored that of Detroit, its huge neighbor to the south. Both cities began as trading posts where Native American trails met rivers, and both quickly sprouted industries dependent on their rivers (in Pontiac's case, flour and saw mills along the banks of the Clinton River). In the early 20th century, both grew into industrial powerhouses thanks to the rise of the carriage and automobile industries. And both cities have suffered long declines as the auto boom faded in the late 20th century. Yet despite obvious challenges in recent decades, both cities still retain a wonderful legacy of fine housing stock—testaments not only to their previous economic and industrial might, but also their great potential for future redevelopment. Both Detroit and Pontiac have early 20th-century neighborhoods called Indian Village laced with streets bearing Native American names. While Detroit's historic Indian Village, first developed in 1893, is well known and loved, Pontiac's remains more obscure. 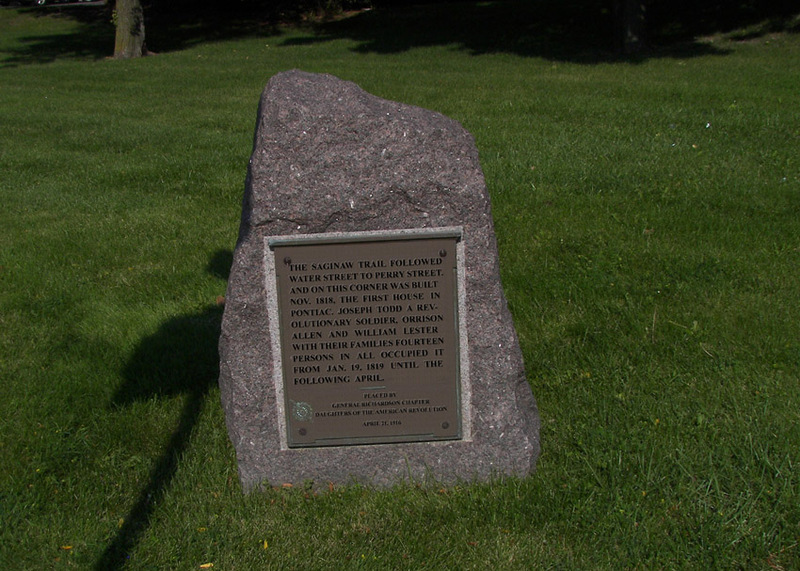 (In fact, Indian Village isn't even officially recognized by the city of Pontiac as a historic district.) The neighborhood sits on about 70 acres north of Huron Street and east of Telegraph Road on the city's west side. In contrast to Detroit Indian Village's rows of mansions built for prominent residents like Edsel Ford, the Pontiac neighborhood features modest 1920s- and 1930s-era workers' houses, including several Sears kit houses. Partners Glen Konopaskie and Christian Marcillo saw the potential for beauty in a neglected 1928 Indian Village house they bought in 1999. Together they run Future Help Designs in downtown Pontiac, where Glen also chairs the Pontiac Downtown Business Association. He counts fantastic neighbors, a sense of security, and interesting architecture among the reasons they call the neighborhood home. Just to the south of Indian Village, picturesque Seminole Hills—possibly Pontiac's best known neighborhood—is much more akin to Detroit's Indian Village. The National Register historic district of nearly 500 homes was laid out in the 1910s, and within a few short years, construction of fine dwellings was well underway. Prominent Pontiac resident M. E. Crofoot had previously owned the 103-acre site bounded by Orchard Lake Road and Huron and Voorheis streets. To accommodate growing prosperity and housing demand in the 1920s, the site was carved into blocks between winding streets. The neighborhood's layout is just confusing enough that, according to Pontiac photographer and Oakland County Pioneer and Historical Society volunteer Barbara Frye, "if you don't know your way through the neighborhood, you WILL get lost." Ottawa Street, the neighborhood's north-south spine, features Seminole Hills' grandest houses built in Tudor revival, Colonial revival, craftsman, and other popular styles of the day. Lots shrink and houses become a little less grand fanning east and west from Ottawa. Developers still promoted the district as a whole, crowing that "a lot in Seminole Hills means a home to you and a home in Seminole Hills means a lot to you." 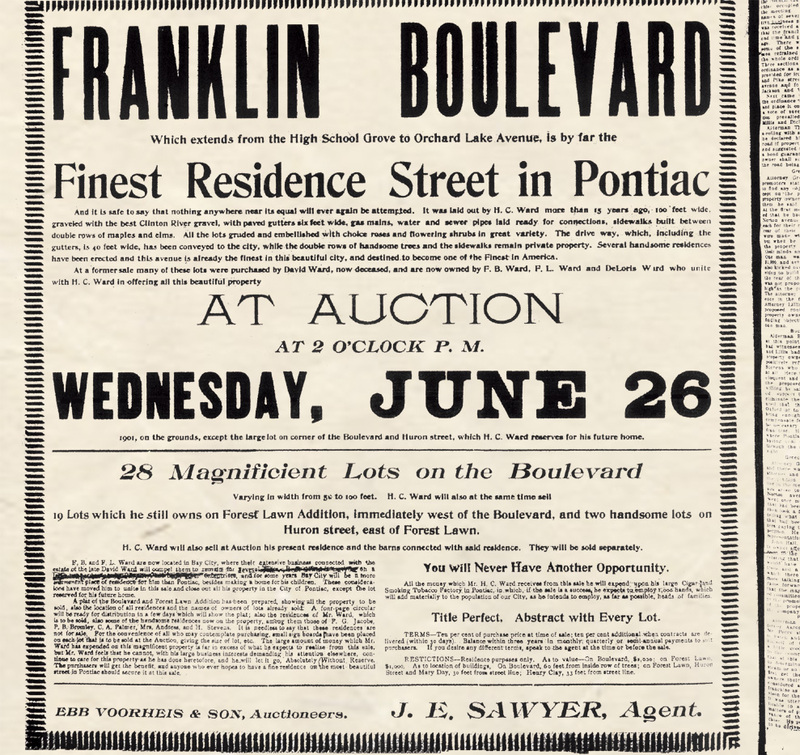 John Cohassey, former chair of the Pontiac Historic District Commission and a 20-year resident of Seminole Hills, remembers a time when the area "was known as the Indian streets" neighborhood. That was before the city of Pontiac adopted Seminole Hills, the original land development company's name, as the neighborhood name in the 1970s. Joseph Bishop, an Ottawa Street resident for 15 years, boasts that houses for sale never remain on the market long. He adds that though it may be somewhat expensive to update windows to historic standards mandated by the city, he is happy to oblige. "I do respect the city wanting to keep the historic integrity of the neighborhood," he says. East of Seminole Hills is the 360-acre Franklin Boulevard Historic District of 90 historic buildings in Greek revival, Italianate, Queen Anne, stick, and other popular Victorian-era styles. The oldest, the Italian villa-style Myrick-Palmer House, dates to 1848. The Murphy House Bed and Breakfast, originally the home of physician J. J. Murphy, went up in stages between 1895 and 1902 in a combination of Gothic Revival and Queen Anne styles. Franklin Boulevard Subdivision deed restrictions required residential use for any building erected, at a minimum cost of $200,000, quite a fortune at the time. Original homeowners included prominent leaders of Michigan's lumber, mining, carriage, and automobile industries such as Oliver Leo Beaudette, whose O.J. Beaudette Body Company pioneered the use of metal in automobiles. Rivaling Franklin Boulevard was Fairgrove Avenue, a tree-lined street of late Victorian homes north of downtown Pontiac. Franklin had somewhat larger houses, though, and much better marketing, so it won the publicity race. The Fairgrove Avenue Historic District has seen its ups and downs recently, but still boasts an enviable stock of historic architecture in a variety of turn-of-the-century styles. Fairgrove has an interesting pedigree, being built on the site of a Civil War-era military encampment that later hosted the Michigan State Fair before it moved to Eight Mile and Woodward in Detroit. About a half mile northeast out Perry Street from Fairgrove is the Modern Housing Corporation Addition Historic District. General Motors planned and developed the 61-acre site beginning in 1919 for worker housing. All but 12 of its 261 homes were constructed in 16 repeated, identifiable forms with some variation in porches and dormers. Though built as worker dwellings, they were still "very charming and very quality," according to Cohassey. "You could shoot a cannonball at them," he laughs. Each of these historic neighborhoods surrounds a burgeoning downtown, itself a growing neighborhood with about 270 dwelling units in a variety of building types, from small Civil War-era storefronts to a large former Sears, Roebuck & Co. department store redeveloped as Lafayette Place Lofts. That number may virtually double if a group of investors has its way over the next few years. And if those lofts get built, the new residents (and new employees in restored commercial buildings) will want places to eat and things to do. So here come a new Slows Bar-B-Q and a renovated Strand Theatre, built in 1921 on a Civil War foundation. The Downtown Business Association hopes to craft a business attraction strategy later this year to fill more of the neighborhood's storefronts. Other major projects outside of Pontiac's downtown and neighborhoods will help transform the city as a whole. GM committed $200 million to expand its Powertrain Engineering Headquarters at 777 Joslyn Rd. St. Joseph Mercy Oakland built a $129 million patient tower at its campus at 44405 Woodward Ave. And the $60 million M1 Concourse project is on track to open its luxury 'car condo' project next year at Woodward and South Boulevard on a former GM facility site. The city is weighing in, as well, with a brand new master plan to help guide redevelopment. As part of the master plan, City Council adopted the Downtown Pontiac Transportation Assessment, an Oakland County initiative to reconfigure the Woodward Loop as two-way and increase connectivity between downtown and the neighborhoods and accommodate increasing non-motorized transportation. We've come a long way from when French political thinker Alexis de Tocqueville described Pontiac in 1831 as "about 20 pretty houses" surrounded by "the unbounded forest". Today's city of around 60,000 people has seen enormous upheaval in the 20th century. But with increasing interest in traditional neighborhoods and downtowns across the country, and an abundant supply of its own beautiful historic housing and downtown space, Pontiac, like Detroit, has a new lease on life. Michael Boettcher is a Detroit-based freelance writer and an independent planning and development consultant. He currently serves as the downtown manager of the Pontiac Downtown Business Association.